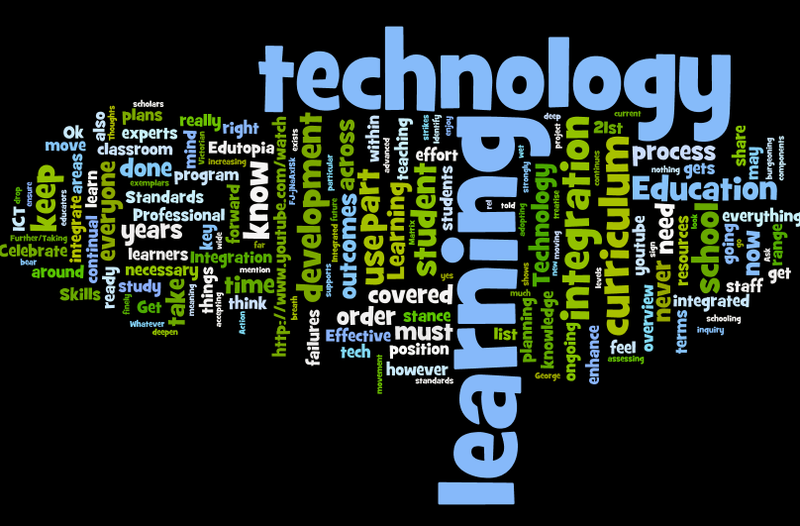 ICT, IT, technology integration, 21st century learning… the list goes on. Whatever your position within a school, however “forward-thinking” you or your organization may be, there are a lot of terms out there and the list continues to grow. I am going to ask for a leap of faith here. We all have more to learn and by adopting this stance we can move forward together as learners, encouraging those of us who need to feel a little courageous moving into the unknown. It is instructive, since we are educators and familiar with terms specific to teaching and learning, to proceed as though we were devising a unit of study for a class. I will try to remain brief. This is an overview not a manual or a treatise after all. The implementation of any such venture, however, will take years to develop and will never be done. Ask one of those who thinks they know everything what the next three important technologies will be. Then enjoy the silence. Where are we at, right now, as a school? Get everyone on the same page by starting with the basics. Do not rush into planning committees before everyone knows what the goal looks like. Invite stakeholders with more knowledge to be part of the process as presenters. FOCUS QUESTION: Why integrate technology across the curriculum? Once we have established why we should integrate, let’s take a look at how. Workshop time. Integration and planning focused staff learning opportunities. Everyone gets wet! Identify key areas of focus and invite staff to sign up for a range of workshops with the proviso that they come back, not as experts, but learners ready to share with the rest of their burgeoning Professional Learning Community. Get busy applying in the classroom. Brainstorm in your teams where YOU think integration fits naturally to increase learning outcomes across the curriculum. Celebrate your successes, share your failures. An open, accepting forum will help to ensure everyone gets on board. Celebrate your failures. It will make you, your team, your school and your program stronger if you embrace attempting new things. You can find an overview of how these resources can be used in concert here. I would also encourage you to keep in mind this definition cut and pasted here for your reference from The George Lucas Education Foundation’s Edutopia blog. It is also important to bear in mind that a wide range of scholars have argued that knowledge about technology cannot be treated as context-free, and that good teaching requires an understanding of how technology relates to the pedagogy and content. Integrated: The use of technology is embedded in the curriculum. Students learn how to use it as part of study in order to improve learning outcomes. Articulated: It is clearly defined as to the wheres and whens in order to avoid letting the development of necessary skills to slip through the cracks. I would add a note here that any program of integration must be reviewed in an ongoing fashion and that where inspiration strikes teachers should never be told not to use a technology they feel strongly will enhance student learning because it is meant to be covered later. Documentation exists to serve student learning and not the other way around. Vertical: The learning of technology in the classroom is considered throughout the years of schooling. Skills and technology that have been identified as necessary are covered at increasing levels of complexity, building on previous learning and skill development. Go to this site for fantastic exemplars. As within our classrooms, this is a fundamental and ongoing part of the process. It should be continual at an individual level and shared for assessing current outcomes and revising plans for future movement at regularly scheduled meetings. Ok, now that’s all done. Did I mention the part about student learning being best advanced through self-directed inquiry meaning your finely tuned plans are really just a wonderful skeleton around which student choice may turn them into mere phantoms? Well, not exactly, having spent the time and effort to get this far, you are in a much more informed position from which to guide students through project or challenge based learning strategies should your school wish to go down those roads. Check out (again on Edutopia) Project-Based Learning Professional Development Guide. Remember, the longer the road ahead of you, the more you need to keep looking backwards at all the ground you have already covered to keep up your momentum. Your students are worth the effort. This entry was posted in Digital Learning, Literacy, New Media and tagged 21st century, Application, classroom, education, future, global, higher order, ICT, integration, NETS, network, new thinking, philosophy, skills, standards, Tech. Bookmark the permalink. Wow, great post! Very definitive. As my school looks to go from a stand alone class system to an integrated, coach style system next year, I’m sure this article will come in handy. I will be sure to send it to my replacement. Has a Mister Norris heir been determined then? See you in Yokohama tomorrow. The final night! I think there has been a replacement appointed but I’m not sure if it’s official or not. Will chat with you tomorrow about it. This is something you could go to admin with and say this is what we need to happen to make our school a 21st Century learning environment. And I think it is so fantastic that you recognize that even after all the planning, the learning may go in an entirely different directions. (The line “student learning being best advanced through self-directed inquiry meaning your finely tuned plans are really just a wonderful skeleton around which student choice may turn them into mere phantom” was incredible image!). And the fact is, as you state, our kids are worth all this energy and hard-work, and flexibility. Thanks! The first piece of advice my mother gave me about teaching: Always know the reason you are doing what you are doing. I spent High School learning how to program in BASIC and learning RAM vs. ROM via textbooks. The programming helped with my logic – but all other “tools” learning is now irrelevant. 1. How could technology help students understand concepts? 2. How could technology help students better communicate their understanding or their message? Look at the myriad of possibilities and teach students to make effective choices in both the reception and production of information. The tools will change. At some point, the students will need to choose between a myriad of tools without our guidance. I wish my teachers had spent less time teaching me Appleworks 1987 version. Thanks for sharing your thoughts. You can consider your two questions “appropriated”. I’ve checked out your blog and started following you. Some great ideas there. Hey thanks for sharing your thoughts Adam. Funny you should comment today, I saw your picture on the YIS site. I’ve started researching for the site I’ve been asked to produce for DISK. I am now teaching MYP and, yes, conjuring authenticity has already proved challenging in this new framework. I’ll miss the COETAIL banter Saturday. Too far a commute! Glad to still be in touch. Say hi to the cohorts for me. This is a great resource Sean! I only wish someone had been able to help our school develop our technology/1:1 program in this way. Thank you for sharing!